Finland-based Mantsinen Group Ltd Oy is steadily becoming larger and faster. 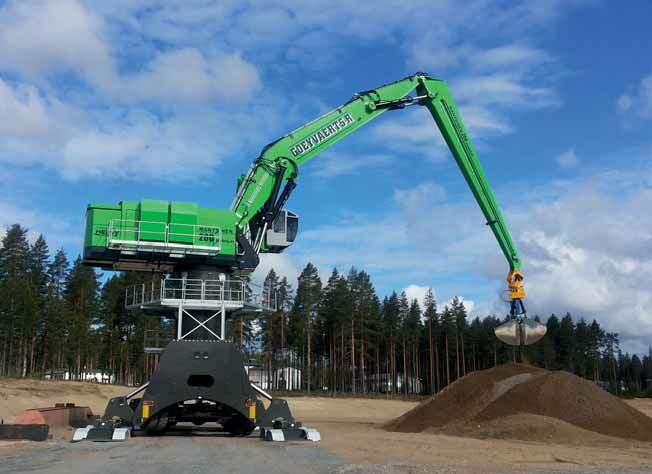 The newest addition to Mantsinen’s range of hydraulic material handlers is the Mantsinen 200 M HybriLift®, world’s largest wheel-based hydraulic material hander to date. The Mantsinen 200 M HybriLift® is aimed at sea ports and river ports handling barges and vessels up to Handymax size. Hydraulic material handlers are best known for effective bulk handling thanks to the short cycle time and high productivity. The Mantsinen 200 M HybriLift® brings these benefits also to container handling and breakbulk. For example, heavy steel products like coils or billets can be precisely and safely unloaded/loaded with over 45 cycles per hour. With a quick change of attachment, the Mantsinen 200 M is ready for bulk handling with even shorter cycle time. The robust wheel base of Mantsinen 200 M HybriLift® is ideal in large port areas, where machines have to be driven long distances on a regular basis. Despite Mantsinen 200 M HybriLift® weighing about 270 tonnes, depending on configuration, it has a travel speed up to 5km/h and a turning radius less than 12m. Mantsinen 200 M HybriLift® has a strong and proven track record to improve energy efficiency by up to 35%. During each working cycle, energy is stored in hydraulic accumulator system and again recovered to lift the main boom. The Mantsinen 200 M HybriLift® also allows the use of downsized engines and motors with lower emissions, improved fuel economy and lower maintenance costs. Mantsinen’s 200 M HybriLift® can be customized to individual customer’s needs. The Mantsinen 200 is available with diesel engine or electric motor, various undercarriage heights and front equipment configurations, several cabin positions including cabin elevators plus a wide array of optional items, such as remote access to the machine control system etc. The walk-in upperframe structure allows easy and safe maintenance indoors. The world’s first Mantsinen 200 M HybriLift® will be delivered to the Antwerp port area, Belgium, in July 2014, together with dealer Heavy Handling. The future owner of the machine, Goeyvaerts R. bvba, is excited to add the machine to its fleet. “During the test drive we were extremely impressed with the speed and precision of Mantsinen 200 M. We believe that this machine changes the game in large ports and brings our productivity to the next level,” commented Kevin Goeyvaerts.